Plasma insulin and glucagon concentrations in dogs subjected to the i.c.v. insulin protocol. 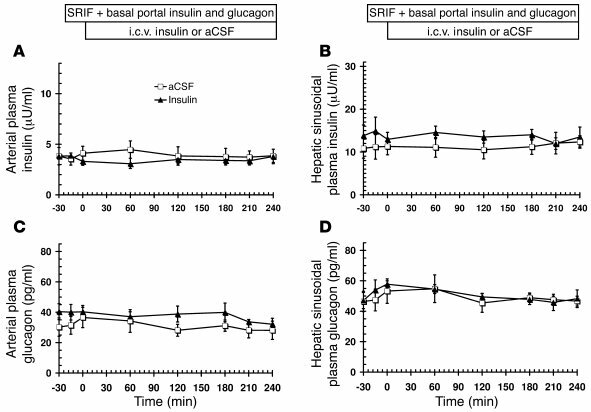 As illustrated above the graphs, 18-hour fasted conscious dogs received peripheral infusion of somatostatin (SRIF) and were maintained on a pancreatic clamp at basal levels of hepatic insulin and glucagon, then exposed to i.c.v. infusion of either aCSF or aCSF plus insulin. (A) Arterial plasma insulin. (B) Hepatic sinusoidal plasma insulin. (C) Arterial plasma glucagon. (D) Hepatic sinusoidal plasma glucagon. Values are mean ± SEM. n = 5 per group.